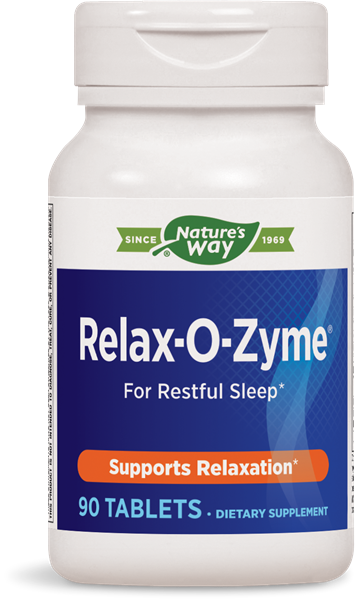 Relax-O-Zyme® / 90 tabs - Nature's Way®. For daytime support take 2 tablets daily. For additional nighttime support take 2 tablets before bedtime. Are the hops in Relax-O-Zyme® the same as the hops used to make beer? If a person is allergic to hops, can they take this product? The hops (Humulus lupulus) extract in Relax-O-Zyme® is made from the cone (strobile) of the female hops plant. The strobiles look like small green pine cones. The dried strobiles of hops supports relaxation and sleep.† It is the same plant part used for making beer. It is very difficult to quantify an allergy potential for any particular substance because individual sensitivities differ. However, if an individual is allergic to hops, they need to be aware that a small amount of hops are in the product. In situations where there are concerns about specific allergies, we encourage consumers to discuss the potential for allergic reactions with their allergy specialist should they have further questions. Consult a healthcare professional before use if you are pregnant, nursing or taking sedatives, tranquilizers or any medications. Avoid alcohol and do not drive or operate machinery while taking this product.